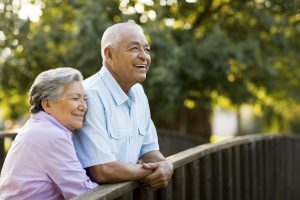 If you’ve suffered severe tooth loss or are on the brink of having a number of teeth removed, you may fear that you’re looking at a long life with loose or ill-fitting dentures. But we’ve got good news: today’s prosthetics aren’t much like those that your grandfather may have struggled with. A denture retained by dental implants mimics your natural teeth so well you may even forget they’re not the ones you’ve always had! So, why stay in the stone age with a loose, uncomfortable prosthetic? 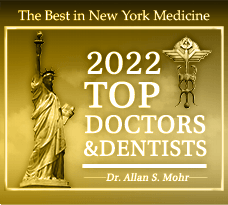 Dr. Allan S. Mohr wants to bring your denture into this century with dental implants. 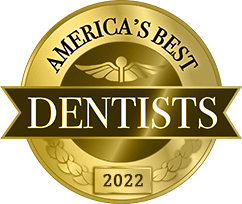 Because you deserve nothing less than a beautiful, functional set of teeth! Dental implants are a comprehensive replacement option for missing teeth. When you have suffered tooth loss, you’ve lost each visible crown as well as its root — the portion that is responsible for encouraging blood flow and the distribution of nutrients to the jawbone. Titanium posts that are inserted beneath the gum line, dental implants take the place of the tooth’s root to stabilize the prosthetic that is affixed on top and encourage continued oral health. Dental implants can retain a single crown, a bridge, or a partial/complete denture. In the case of a denture, you won’t need to have an individual implant for each missing tooth. Instead, the prosthetic can be secured with several strategically placed implants. 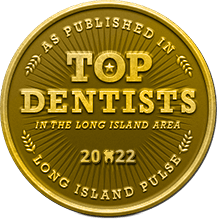 Dr. Mohr partners with Long Island’s best oral surgeons and periodontists for the placement of dental implants. Once the jawbone has healed, you will return to our office for their final restoration, or when the denture is affixed on top. The advantages of retaining a denture with dental implants are significant. Benefits include improved oral health, better stability, and a longer-lasting investment. Dr. Mohr strongly encourages the implant-retained option for eligible candidates. By stabilizing the jawbone and preventing the loss of volume, dental implants promote better oral health over a lifetime. Traditional dentures need to be refitted every five to seven years. Dental implants can last for decades. Patients can resume eating normally — even biting into a fresh apple is possible with the stability of dental implants! There are no lisps or whistles in speech with a dental implant retained denture. Implant retained dentures do not require denture adhesives. They fit perfectly from day one and for years to come. Most patients who are in good oral and overall health are eligible for dental implants. When significant jawbone volume has been lost due to missing teeth or periodontal disease, a bone grafting procedure may be necessary first. Can you, too, benefit from this comprehensive tooth replacement option? If so, you have a lot to look forward to. Discuss your eligibility with Dr. Mohr. 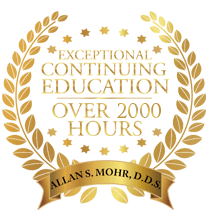 Dr. Mohr loves helping patients benefit from the multitude of advantages associated with dental implants. If you’re dealing with or on the brink of facing significant tooth loss, let’s discuss how we can help with a dental implant-retained denture! Request an appointment at Smile Creations today. by: allanmohr at July 25, 2017 .